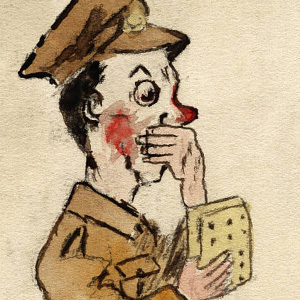 This World War I soldier’s sketchbook is the mark of Cpl. Douglas G. Ward, an otherwise unknown British soldier-artist. Douglas G. Ward entered the military and trained at Catterick Camp, the infantry training center and was assigned to the 7th Battalion, South Staffordshire Regiment which was part of the 33rd Brigade, 11th (Northern) Division, landing at Sulva Bay (Gallipoli) 7th August 1915. Ward was wounded at the Somme and on leaving the hospital in 1916 he was transferred to a different unit and was sent to India.His sketches are executed in pen and ink and watercolor and cover subjects ranging from basic training to romance. The sketchbook was acquired in 2006 with funding from the USC Educational Foundation. The sketchbook was purchased by the Thomas Cooper Library for the Joseph M. Bruccoli Great War Collections.